Wash the meat under cold water. Immerse the pork belly meat in a pot of water and boil for about 15 minutes on medium heat. Take away the pork and rest it in a strainer to let it dry for about 15 minutes. 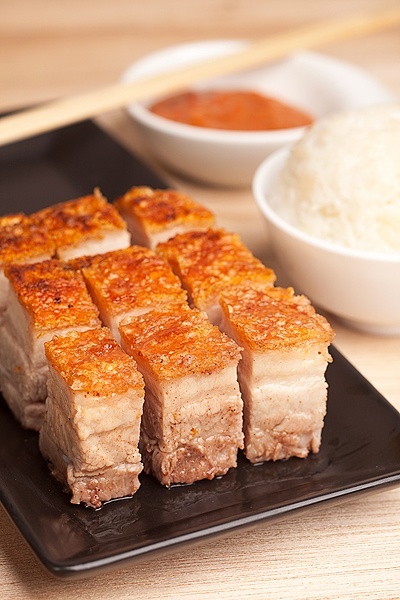 You may take the additional step of patting the pork belly skin dried up with a paper towel for extra crispy skin. Poke the pork with a knife a few times and rub the spices and salt on the flesh only (not the skin). We suggest layering the spices in the following order: 5 spice powder, spiced ginger powder, white pepper and salt. Let it cure for 1 hour, though over night is better for a deeper flavor. In a oven or a large cast iron pan, fill up it with oil sufficient to cover the skin of the pork belly. Stay away from using olive oil since it has a short smoking point. You can put the pork belly in pan while the oil is still cold to prevent splatter. WARNING!!! The pork will splash a lot, so it is better to use an oven with a heavy lid or use a splash screen to place over your frying pan. Fry the skin side first for roughly 5 mins or until golden brown and crispy, turn it on the side and fry it only for a min or two, repeat on all sides (it is best not to fry it on the flesh side for too long as it will toughen the meat) Frying is a skill learned over time, so if the skin is burnt, you can scratch it off with a kitchen knife. Let it rest until cool to the feel and cut into large slices. This entry was posted in Meat, Pork Recipes and tagged Crispy PorkBelly Lechon Kawali, Lechon Kawali on April 8, 2013 by Kram.